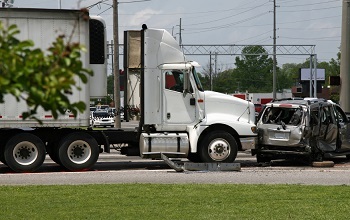 Collisions with large vehicles like semi-trucks or tanker trucks present unique dangers to drivers and passengers in smaller vehicles. Because these vehicles are so large, accidents are more likely to cause fatal injuries, and those in the passenger vehicle bear the majority of the injuries. Most accidents have multiple causes, including driver error, environmental factors, and equipment failures. In approximately 9 out of 10 crashes, however, the main reason for the collision is driver error. The vast majority of car/truck collisions are caused by an error on the part of the passenger car driver. In a study by the Federal Highway Administration, 71% of fatal accidents between cars and trucks were the fault of the car driver, 16% were the fault of the truck driver, and 10% were attributable to both drivers. The statistics are clearwhile large trucks pose unique dangers to passenger vehicles, it is often the smaller car which causes the accident. Driving in the No-Zone: Truck drivers have limited vision in the areas directly behind or beside large trucks. Avoid driving in these areas so that the driver can see you. Maneuvering in front of a turning truck: Large trucks need a lot of space and time to complete a turn. Do not try to cut in front of a truck that is turning, and make sure you leave plenty of space. Quickly cutting or merging in front of a truck: Semi-trucks and other heavy vehicles cannot change lanes or slow down quickly. Make sure to leave sufficient space between your vehicles so that the truck does not have to swerve to avoid you or brake suddenly. Misjudging a trucks speed or distance: When pulling out into traffic, leave more space between you and an oncoming truck than you would with other vehicles. When in doubt, play it safe and wait for the truck to pass. The drivers of large trucks often share the blame for many accidents, especially in less severe crashes. Whether an accident is attributable to poor truck maintenance, an inexperienced driver, or other safety risks, truck drivers also need to be aware of special dangers which can make their truck hazardous. Truck drivers often face heavy pressure to transport their loads on time and under deadline. This can lead to unsafe practices like speeding or skimping on sleep(http://www.edwardslawok.com/truck-driver-fatigue.html). Truck drivers should always remember that safety is more important that deadlines, and should make sure they remain alert enough to anticipate the behavior of drivers around their vehicles. An accident with a large truck can be a devastating and life changing experience. If you have been injured after an accident, you need a law firm that knows how to handle trucking companies and their insurance carriers. At The Edwards Law Firm, our auto accident lawyers have the knowledge and professionalism you need on your side to take home the maximum recovery for your claim.